The British Boxing Board of Control has warned all those involved in the heavyweight promotion between David Haye and Dereck Chisora that they will be automatically stripped of their licences. The board is determined to come down hard on the show, which has been sanctioned by the Luxembourg Boxing Federation despite neither Haye nor Chisora currently holding licences to box in Britain. And their warning tonight means any licence holder – including the promoter Frank Warren, managers, seconds and other fighters on the bill – will be deemed to have broken the terms of their membership, and instantly stripped. The Board said in a statement: "The Articles of Association … of the British Boxing Board of Control, to which every member has agreed to be bound, make it perfectly clear that the object of the BBBoC is to control and regulate boxing in the United Kingdom. "Any member of the BBBoC who participates in any way in a promotion such as that referred to above would thereby evince an intention not to be bound by the Constitution of the BBBoC and would act in a manner wholly incompatible therewith. "In such circumstances the BBBoC would accept that member's repudiation of the Constitution as terminating his/her membership of the BBBoC and his/her licence." While the threat will not unduly worry either Haye or Chisora – who in a sense already have nothing to lose – it could have a devastating impact on those working around the fringes of the promotion. 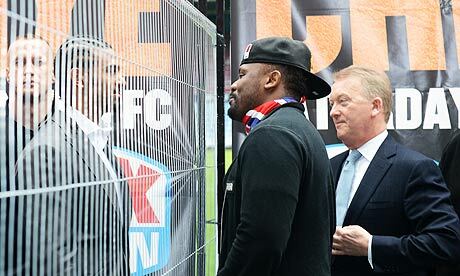 The Board's decision to clamp down hard follows widespread criticism of its decision to strip Chisora of his licence in April following his press conference brawl with Haye in Munich, rather than hit him with a specific ban. Chisora is appealing against the decision, but as both he and Haye are unlicensed rather than banned, it made it easier for the Luxembourg Boxing Federation to sanction the contest. While there is nothing in boxing rules that prevents the exploitation of such a loophole, there is a commonly held assumption in the sport that one commission's ruling will be automatically respected by the rest. In the statement, the BBBoC said its stewards "condemn any attempt by the Luxembourg Boxing Federation to stage the contest. "Those behind the proposal are not concerned with the interests of the sport of professional boxing. "Any member who participates in such a promotion would bring the sport of boxing into disrepute and would wholly undermine the authority of the British Boxing Board of Control, of which he/she is a member, as the regulatory body for professional boxing in the United Kingdom. "This is nothing more than an attempt to circumvent the decision of the stewards of the British Boxing Board of Control, in respect of Dereck Chisora, for monetary gain. "Dereck Chisora's proper remedy is by way of appealing to the Independent Stewards of Appeal, which is due to take place on 2 July, 2012. "Participation includes taking any steps directly or indirectly, to arrange, advertise, broadcast, facilitate, officiate or take part in any way in such a promotion."